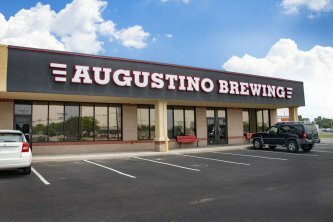 Augustino Brewing Company was founded in August 2015 by Augustine and Bianca Iacopelli. We have two boys and dreamed up Augustino Brewing as a means of showing our children the value of hard work and chasing after big dreams. Our goal is to create a space where friends, lovers, and families can find respite from the rigors and stress of the modern world over a pint or two of our house-crafted beers brewed in our 3.5-barrel brewery. We believe the best times in life are spent enjoying a beverage of something you love with someone you love. After more than 2 years of planning and preparation, Augustino Brewing Company opened to the public in November of 2017. After careful consideration, we decided to place our focus exclusively on our beer. While you can still order wine, limited spirits, and food, Augustino Brewing Company is refocused on what we enjoy and love most, OUR BEERS! We love educating new craft beer drinkers and talking “beer” with seasoned craft beer fans. Make sure to ask for a taste of 1 or several of our beers on tap. We love pairing the right person with the right beer. Venue rentals are also available at Augustino Brewing Company. For more information, call us at 316-721-5554 or email augustine@augustinobrew.com. Join our mug club for $25 and receive a signature Augustino Brewing stoneware mug. Bring back the mug and get your 20oz mug filled for the pint price.